Here are some Short Moral Stories by Aesop. These stories are part of a collection commonly known as Aesop's Fables. Aesop is believed to have been slave who lived in Greece about 2,500 years ago. Print as many copies of these stories as you like for your own personal use. Click the links below for more Short Moral Stories and other printable reading materials. A man was driving a truck in the rain, when the wheels sank deep into a rut in the mud. The driver immediately prayed to Hercules for help. Hercules appeared and said, "Man up and put your shoulders to the wheels, lazy fellow! Never more pray to me for help, until you have done your best to help yourself! Depend on me, and you will henceforth pray in vain." Then Hercules disappeared and was gone. Moral: Never ask for help until you've done everything in your power to do the job yourself. Some ants were cozy in the warmth of their hill on a winter day. They spent the day drying grain they collected in the summertime. Up to the hill crawled a starving grasshopper begging for food. The Ants said, "You had all summer to save food for the winter. What happened?” The grasshopper replied, "I had fun with my friends, basking in the sun and singing all day long." To this, the ants replied, "If you were foolish enough to sing all summer, you can now dance dinnerless to bed in winter." Moral: Work hard today in preparation for tomorrow. A Dog was crossing a bridge over a stream with a piece of meat in his mouth, and saw his own reflection in the water. He mistook his own reflection for another dog, holding a piece of meat double his own in size. The dog immediately let go of his own meat, and fiercely attacked the other Dog to get his larger piece from him. So the dog lost the larger piece of meat, because it was a mere reflection. And the dog lost his own meat when the stream swept it away. Moral: Be satisfied with the fruits of your labor, and don't try to take what you haven't earned. The rabbit, believing her claim to be utter nonsense, agreed. An unbiased local fox chose the course and marked the goal with tape. As the race began, both creatures left the starting line together. The rabbit zoomed ahead, and was soon lost from sight, as the tortoise meticulously plodded her way along, falling further and further behind. Eventually, the rabbit was so close to the finish line he decided to lie down, to demonstrate to the fawning crowd how easy it is to beat a tortoise in a race. Meanwhile, the tortoise kept moving, never stopping, until she reached the finish line the end of the course. By then, the rabbit had fallen asleep. He woke up just in time to see the Tortoise break the tape. Moral: Slow but steady wins the race. A Farmer placed nets over his freshly sown field, and caught a flock of Cranes, which had come to steal his seeds. Trapped along with the cranes was a stork. The Farmer laughed aloud and said, "Sorry, stork, you are as right as rain, but I can' risk letting a crane escape to save you, and so you must now die with your chosen companions." Moral: Beware of the company you keep. One winter, an unintelligent farmer found a rattlesnake nearly frozen in the bitter winter cold. The farmer had compassion for the snake, and placed it in his jacket to keep it warm. The Snake was quickly revived, and resuming its natural instincts, gave the farmer a mortal bite wound. Cried the Farmer with his last, gasping breath, "It serves me right for trusting an enemy!" Moral: Even the greatest kindness will not bind the ungrateful. A Tortoise complained to a flock of seagulls that she had never learned to fly. An Eagle, hovering near, overheard her lamentation and offered to help. Then the Eagle took the tortoise in his talons he carried her into the clouds, then suddenly let her go,. The tortoise was shattered to pieces on a lonely mountain top. The eagle swooped down and ate her for dinner. A swarm of Flies fell in love with a jar of honey, which had been overturned in a housekeeper's room. The flies jumped in feet first and ate greedily. Their feet, however, got stuck in the honey, and the flies were soon killed and wiped up by the housekeeper. Moral: Before allowing ourselves pleasure, we must consider the consequences. A Dog lay in a manger, and by his growling and snapping prevented the oxen from eating the hay which had been placed there for their supper. "What a selfish creature!" said one of them to his companions; "he cannot eat the hay himself, and yet refuses to allow those to eat who can." Moral: Do not begrudge others what you do not want. A Fox fell into a well and could find a way to escape. A thirsty Goat came up to the well, and seeing the Fox, asked if the water was good. Concealing his sad plight under a fictitious smile, the Fox lavishly praised the water, and encouraged the goat to descend. The Goat thoughtlessly jumped down, and drank of the cool, clean water. 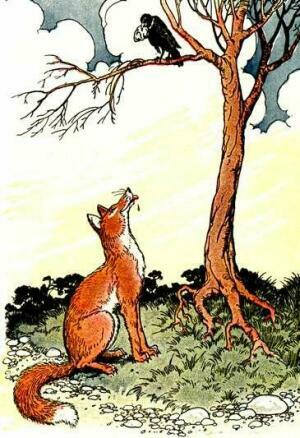 Then, the Fox informed him of the predicament they were both in, and suggested a way to escape. Said the fox, "If you will place your forefeet upon the wall and bend your head, I will run up your back and escape, and will help you out afterwards." The Goat readily obeyed and the Fox leaped upon his back, grabbed his horns, jumped out of the well, and ran away. “You should've planned ahead!” yelled the fox as he disappeared into the distance and was gone.